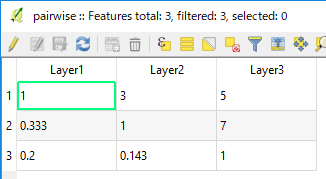 What is the configuration and extension (.txt, .csv ...) of the Pairwise comparisons table file requested by the SAGA AHP tool- Analytical Hierarchy Process - in QGIS? Are there examples of applications available? As of today, working with SAGA through QGIS 2.18 Processing Toolbox would be safer than the latest QGIS 3 (I appreciate your [qgis-2] tag for that reason). You can use any text format to create the Pairwise Comparisons Table, as far as it can be read by QGIS. I would suggest csv format, as I can just drag and drop it onto QGIS window. Please make sure you have one header row, which indicates each input layer. Also note the order of the row (rows 2, 3, 4 in this example) should follow the same layer order. (I mean, row number 2 represents Layer1). (3B)....... select the table layer as the Pairwise Comparison Table. Why SAGA stops working when running in QGIS? How to fix unusual initial DEM input values and derivative raster output values in SAGA GIS without rescaling? How would I determine the best neighbourhood search radius for a Topographic Position Index (TPI) for predictive soil mapping? How to create a Topographic Position Index in SAGA GIS? How would I determine my search radius when conducting a Topographic Position Index in SAGA GIS?